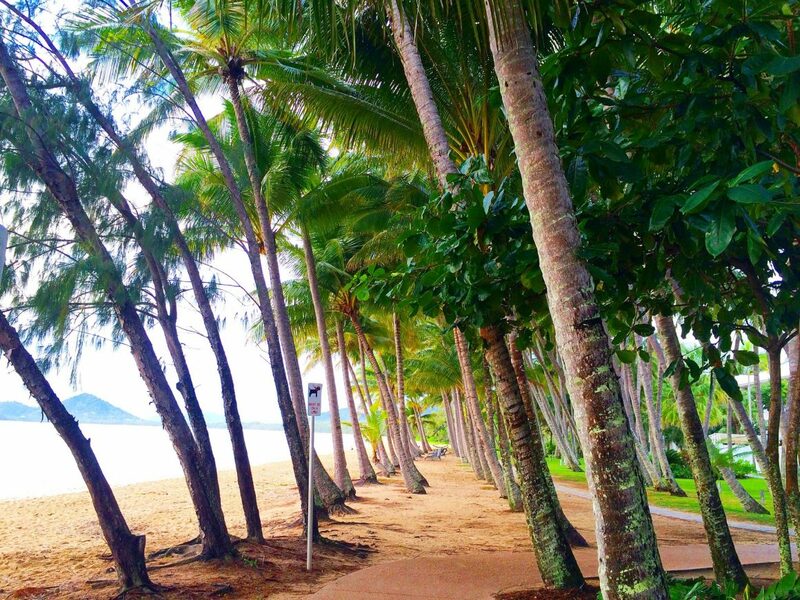 Palm Cove is one of those beach towns that exudes peace and tranquility. It’s a place where you can go and allow yourself to ‘check-out’ from a fast paced world. 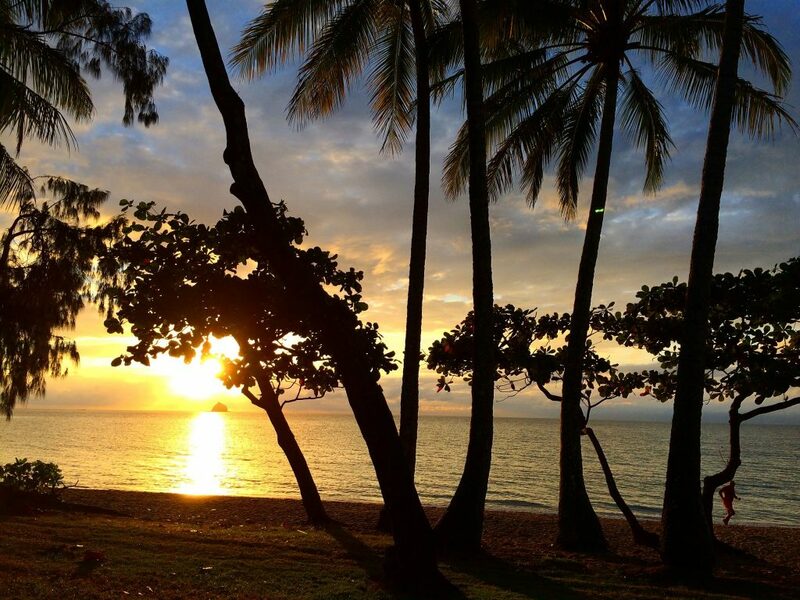 If Cairns and Port Douglas are too busy and touristy for your style then you are going to fall in love with Palm Cove. Billed as the ‘ultimate tropical serenity’ it offers it’s visitors world class resorts, spas and is close by to many tourist attractions. 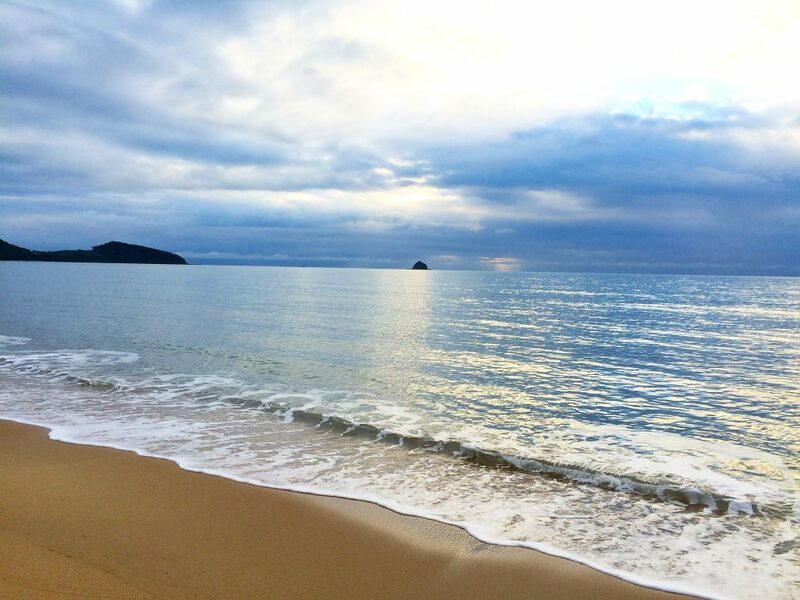 I recently spent a week in Palm Cove, Queensland with my extended family to discover what all the buzz is about with this beautiful little beach town. My parents have been frequent visitors to Palm Cove and have always raved about it’s beachside charm and chilled out vibe. After spending the week in Palm Cove, I discovered why my parents love this town so much and that a week is surely not long enough! Palm Cove is located in far north Queensland, along the Coral Coast, with the Great Barrier Reef located right on it’s doorstep. Palm Cove got it’s name due to the many tropical Palms that line the beach and currently has a population of around 1200 people. Upon arriving in Palm Cove, what I noticed first was the towns peacefulness. Even though there are many tourists about, it doesn’t feel like the town is over-run with tourists. There isn’t a lot of traffic coming through the main street which adds to the overall quietness. 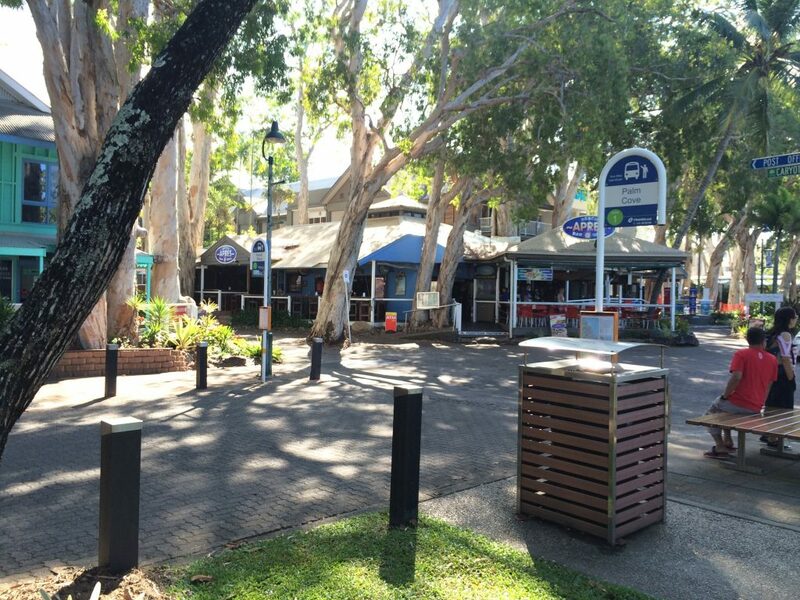 The main street or William’s Esplanade is shaded by palm trees and 500 year old Melaleuca trees. As you walk about, you will notice that the buildings have been built around these Melaleuca trees in order to comply with strict preservation. It certainly adds an interesting and unique look to the buildings in the main street. There is a general vibe of health and wellbeing, people get up early to walk or run along the beach, exercise or participate in beach yoga. Once you are finished the early mornings activities, you can call into one of the cafes for a well earned coffee! Palm Cove has no less than five day spas to further enhance relaxation and spiritual wellness. 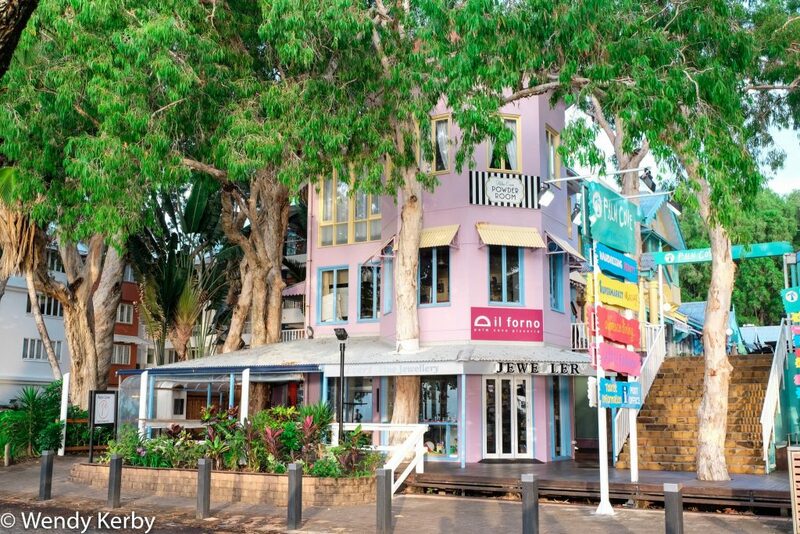 The best part of Palm Cove is that all the restaurants, cafes and hotels are located on the esplanade and each offers fabulous views of the beach. Imagine waking up to sunrises over the beach, sitting having your lunch by the sea, and lets not forget the cocktail happy hours as the afternoon meets the evening. The beach aspect of Palm Cove gives it the edge over other nearby tourist towns such as Port Douglas and Cairns, as it’s main street is right opposite the beach. 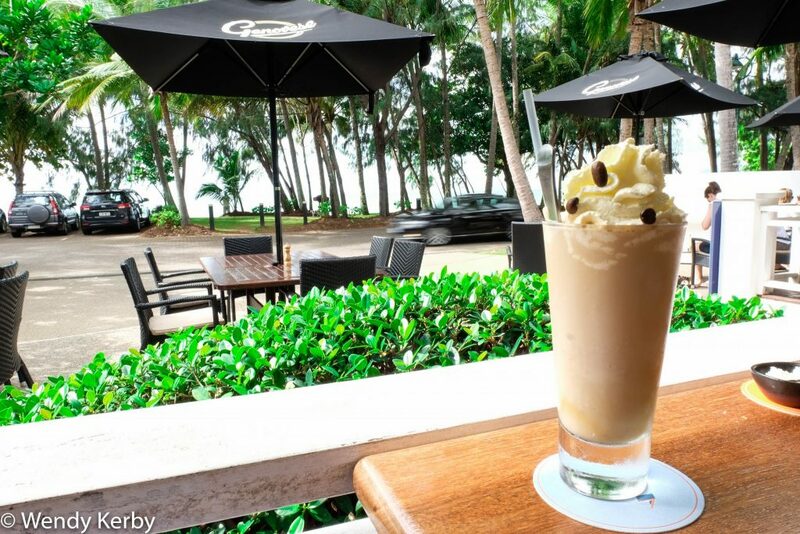 A must do in Palm Cove is to attend one (or more) of the afternoon happy hours. Many of the restaurants along the beach offer this popular afternoon soiree. 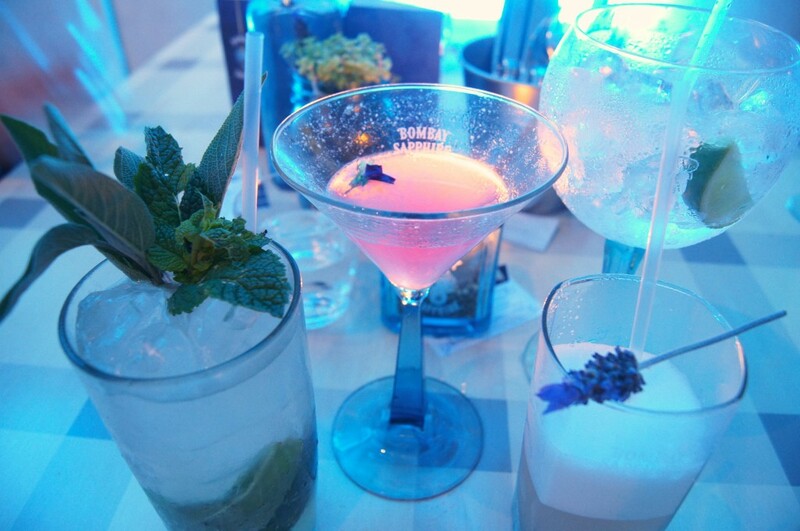 Depending on the venue, happy hour can begin as early as 3.30pm in the afternoon and conclude around 5pm. Popular places to check out happy hour are at Vivo, Chill Cafe and the Pullman, where you can sip on some delicious discounted cocktails and beers. If you are after a little nightlife and fancy yourself a bit of a singer, then you will want to visit Apres beach bar and grill. Each Saturday night, Apres hosts live music and then after 10 pm unleashes it’s Karaoke party until late into the night. Foodies are not forgotten either. Palm Cove has a number of excellent places to eat from fine to casual dining. In fact even the fine dining is pretty laid back and casual. Dress codes are ‘relaxed’ in many places including the Pullman’s Temple of Tastes. Being a beach town, flip flops are welcome everywhere! Palm Cove has a lovely Palm lined beach and has been awarded Australia’s cleanest beach (along with Whitehaven beach). There is a large swimming enclosure that is protected by nets and patrolled. These nets keep the area safe from crocodiles and ‘stingers’ (jellyfish) that may inhabit the area. 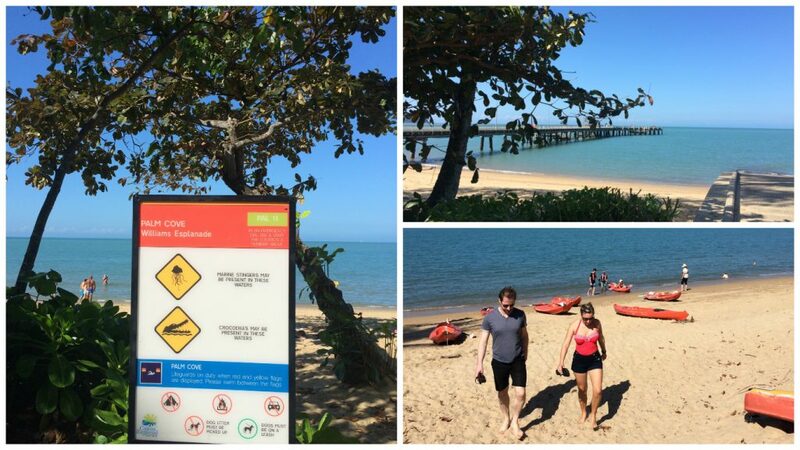 Palm Cove is closely monitored for crocodile sightings. When found to be in the area, they are removed and transported to a farm or zoo. Always swim in the patrolled areas that are protected by the nets. Within Palm Cove itself you can easily walk the length of the main street in around 20 minutes. 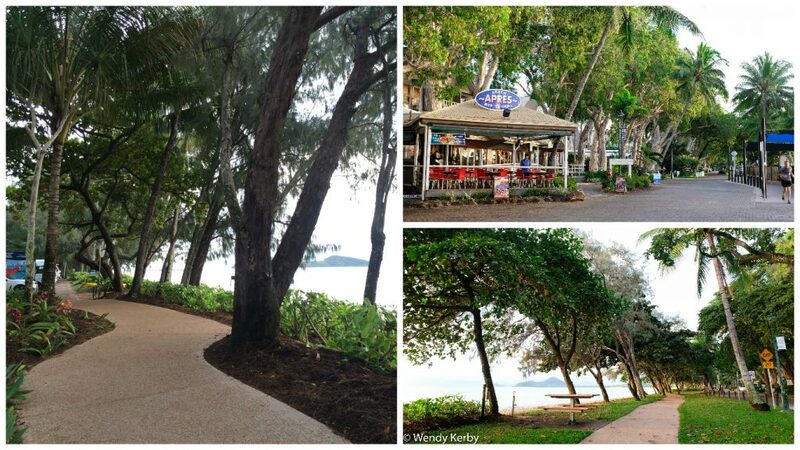 There is a lovely meandering pathway alongside the beach from one end of Palm Cove to the other. Palm Cove has a regular bus service that leaves every 40 minutes and will have you in Cairns in around an hour. There is no bus service between Palm Cove and Port Douglas. 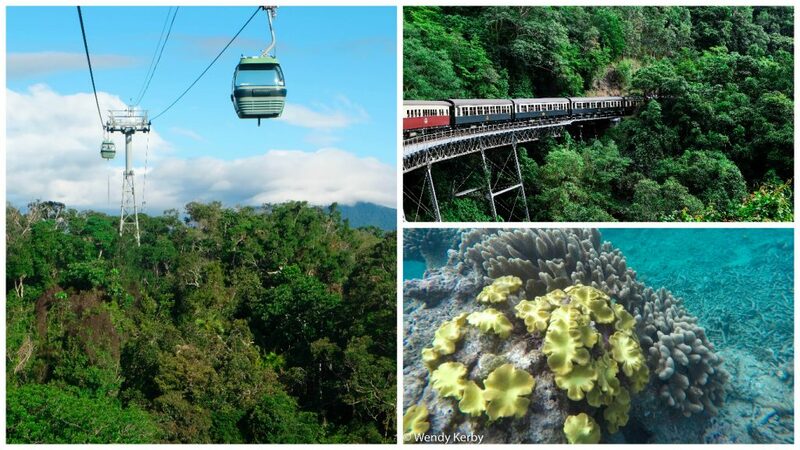 Getting to Port Douglas for the day will require private transfer or perhaps hiring a car. Getting to Palm Cove is just a short 30 minute drive from the Cairns domestic & international airport. An airport shuttle bus runs between Cairns Airport and Palm Cove, which will set you back around $12 (Aus) one way. You can also hire a car as another option. Having a car will give you the freedom to get to and from various tourist destinations.